AJMAL Sarah Tower is an affordable luxury apartment building in Dubai land Residential Complex comprised of 274 apartments designed to the highest international standard. With a signature style that echoes the architecture of the modern Arab world the building has been designed with the quality conscious, and discerning homeowner in mind. 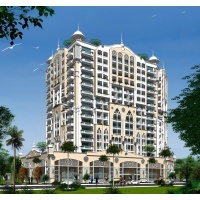 AJMAL Sarah Tower will stand out as a sanctuary of family entertainment, cultural diversity, and serenity. Ajmal Sarah offers 1 , 2 , 3 luxury Bedroom and Studio Apartments located Within Dubailand Development.